No ordinary cats, no ordinary tiger. 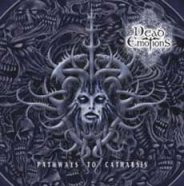 In their third album "Pathways to Catharsis", that will be released in February 2008, Dead Emotions prove that they know how to ride the tiger and how to be elegantly brutal, elegantly sinister. This German band, founded in 1996 doesn`t apply any revolution to Death Metal but is able to nourish the beast with valuable and memorable musical passages. Vocals are applied to main growls supported by malevolent screams, pity that the growls are quite monochrome, however they succeed in doing what they are presumed to do: to arise major threat. The mixture among brutal Death and Melodic Death is well balanced and tainted with somewhat Black Metal ( concerning especially drumming and screams) and with some Thrash inspiration too. Although many influences converge, the general atmosphere of the album takes a self-conscious dark, groovy, mysteriously pounding characterization. Dead Emotions (as the name of the band suggests) tame brutality and cruelty into tractable melodic touches full of empathy. Some songs, thanks to the add of decorous and gradual choirs get deep haunting shades. The powerful soundscape, directly building melodic structures, evokes a moving abyss of sumptuous fear. “If you gaze long into an abyss, the abyss will gaze back into you.” This is what you can feel by listening to the tracks 4 and 11: respectively There is no Dawn and At the end of Time. These 2 songs are in my opinion excellent and surely the 2 locomotives of the album, because they are dynamic, intense, melodic and powerful, immediately growing into you. Demon Seed, pleasantly varied, structured by good logic sequences, is, on the contrary, one of the fastest and most brutal tracks in the wake of Debauchery, band with which Dead Emotions have also played, without mentioning Dew-Scented and Obituary. Point of no Return is an evil creeping pulsing Death song that makes the Dead mosh in the hellfire. Weed for the Weak is another great piece of gracious massacre. I say gracious always for the same reason: here too brutality is corrected and enriched by the tasteful composition. Weed for the Weak is also an example of how powerful and crushing the guitars can be at Dead Emotions` camp. Disdained is a particular song which has left me halfway among doubt and admiration: the pulverizing Death/thrash is a heavy blow, and a pleasure for blood and ears. The hammering bridge, where the pounding rhythmic riffs are echoed by the lead guitar, is simply a dream of classic metal lust, but those guitar inserts that launch and re-launch the Death verse and that are so similar to Iron Maiden of the "Powerslave" era, are a gauntlet thrown down. Act of defiance or act of courage? Borderline is ferocious Death metal assault laying somewhere among American and Swedish school with grandiloquent break - downs. This mood is maintained gain then through the onrush unleashed by Direction Pain and closed by the following Ways of Self Destruction. Finally, the short instrumental Interlude is the true catharsis after such a big tempest of hate, with guitar arpeggios and enough sorrowful feeling. If the album was opened concert-like by a long futuristic menacing intro (Paradise is Hell) , it is closed now by the beautiful At the End of Time, a true sorrowful yet strong boost of soulfulness. Excellent the double bass drum discharge and the conquering bombastic melody. It is in this song that the vocals appear totally convincing and it is in this song that the emotionality and darkness of a band like Before the Dawn is amplified and maked even more obscure. The production is more than satisfying , letting the underground flavour uncorrupted yet well offered. All in all a cool extreme metal experience. If it's true that there are no ordinary cats, surely "Pathways to Catharsis" is no ordinary tiger.